Brussels, BELGIUM – Qatar Airways Chief Executive Officer Akbar Al Baker has spelled out the strategic importance of the airline’s ongoing expansion in Europe following its latest route launch to Brussels. The successful launch of scheduled flights to Europe’s capital city yesterday established Qatar Airways’ 98th international destination and marked the Gulf carrier’s third new European route to open in as many weeks. Qatar Airways began operating flights to both Bucharest and Budapest from its Doha hub in January. Speaking at a press conference in the Belgian capital today, Al Baker said that the airline’s global expansion drive since March last year had seen a total of six new routes opened in Europe alone. In addition to the three latest routes, Qatar Airways has introduced flights to Copenhagen, Barcelona and Nice in Europe, and plans to add Stuttgart next month. The airline has also implemented frequency and capacity upgrades on select existing European routes to enhance its network on the Continent. “Qatar Airways has in recent months concentrated on growing its European network by boosting capacity and frequency, as well as establishing new routes to underserved cities. The importance of flying to cities across Europe cannot be understated. It remains a highly important part of the world where we have seen other airlines withdraw capacity,” said Al Baker. The Doha – Brussels route has been launched with five-flights-a-week operated by a wide body Airbus A330, featuring up to 30 seats in Business Class and up to 275 seats in Economy. 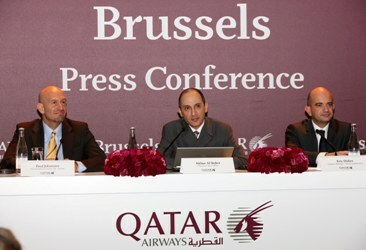 Added Al Baker: “Brussels is the 24th European destination in Qatar Airways’ global network, representing 25 per cent of our international presence, so it is clear that this is a vitally important region in our ever-growing route map. “Much has been said in Europe about the expansion of Gulf airlines in Europe. But we are operating in an environment where there is demand, and where customers want greater choice and want an alternative experience to the services offered by legacy carriers. “Qatar Airways is a young and vibrant airline and it has been expanding at a pace that creates unease among our competitors. There should be an operating environment where competitors ought not be afraid of each other and not feel threatened. Qatar Airways prides itself on its Five Star ranking for service and excellence, as awarded by the Skytrax airline industry monitor. The airline’s competitive product focuses on comfort, cuisine, and in-flight entertainment, award-winning in-flight service and a fleet of aircraft that is young and modern averaging just less than four years old. On March 6, Qatar Airways adds Stuttgart to its global network, followed on April 6 by new flights to the historic Syrian city of Aleppo – the airline’s milestone 100th destination. By 2013, Qatar Airways plans to serve more than 120 key business and leisure destinations worldwide with a fleet of over 120 aircraft. Today, the airline’s fleet stands at 94 aircraft, flying to destinations across Europe, Middle East, Africa, Asia Pacific, North and South America.